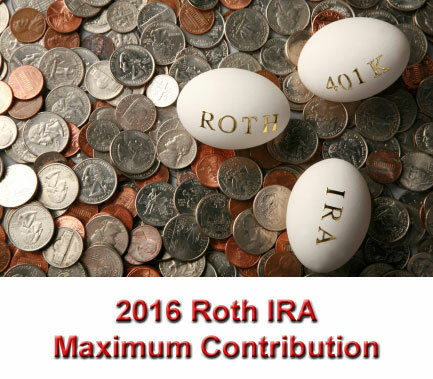 What is the 2016 Roth IRA maximum contribution? That's a great question, and you need to know the answer if you intend to make a contribution to your Roth IRA for the 2016 tax year. Even if you don't plan on maxing out your Roth IRA contribution in the upcoming year, it's important to know your limits. Otherwise, you might get slapped with surprise taxes or penalties from the IRS. So what's the maximum 2016 dollar amount you're eligible to contribute to your Roth IRA? For instance, if you don't reach the age of 50 sometime during the 2016 tax year, your 2016 Roth IRA maximum contribution is $5,500. Absent highly unusual circumstances, that's the absolute maximum amount anyone under the age of 50 can contribute to a Roth IRA. However, don't forget that IRS income limits restrict your ability to contribute. For instance, let's say you're 44 years old, married, and you and your spouse have a combined income of $151,750. Under IRS rules, you can make a 2016 Roth IRA maximum contribution of $5,500. However, six years from now, when you turn 50, you maximum contribution goes up to $6,500 (or whatever the maximum amount is in 2022). Generally speaking, you're eligible to make a larger Roth IRA contribution if you're 50 years old or older. Assuming you earn less than the 2016 Roth IRA income limits for making a maximum Roth IRA contribution, you're eligible to make a maximum contribution of $6,500 per year. So what are the income limits? As long as your income doesn't exceed these limits, and you're over the age of 50, you can make a maximum Roth IRA contribution of $6,500. For instance, let's say you turn 50 years old in the middle of the 2016 tax year. You're single and earn $96,500 per year. How much can you contribute in the 2016 tax year? Because you're over 50 (as long as you turn 50 during the tax year, you qualify), and your earned income is below the $117,000 threshold for making the maximum contribution. But what's the maximum amount you can contribute in the 2016 tax year? Even though your income is below the threshold for making the 2016 Roth IRA maximum contribution, you haven't yet reached the age of 50, so your maximum contribution amount is $5,500. Unfortunately, not everyone is eligible to make a 2016 Roth IRA maximum contribution of $5,500 or $6,500. Because the IRS places income limits on your ability to contribute to a Roth IRA. What are the 2016 limits? Unfortunately, if your earned income exceeds the IRS threshold, your 2016 Roth IRA maximum contribution is zero dollars. If you're single and earn $170,000, you can NOT contribute to your Roth IRA. Because a single person making more than $132,000 is ineligible, but a married couple isn't ineligible until they earn $194,000 or more. So what happens if your income lands you somewhere in between the threshold for making the maximum Roth IRA contribution and the threshold for being ineligible? Your Roth IRA maximum contribution phases out. Exactly where your income falls within the ranges outlined above determines how much you can contribute. If your income is within one of these ranges, read 2016 Roth IRA Phase Out Rules to properly calculate your Roth IRA maximum contribution. If you're lucky enough to earn too much to make a 2016 contribution to your Roth IRA, you can still make the maximum contribution if you wish. Well, thanks to the January 2010 elimination of the $100,000 income limit on Roth conversions, anyone can convert a Traditional IRA to a Roth IRA regardless of personal income. And anyone can make non-deductible contributions to a Traditional IRA even if they earn too much to qualify for tax deductible contributions. As a result, you can make non-deductible contributions to your Traditional IRA in 2016, then immediately convert it to a Roth IRA. Since the contributions were non-deductible, you don't force any tax liability and you end up with a 2016 Roth IRA maximum contribution even though your income disqualified you from making a direct contribution. This is really simple if you don't currently have a Traditional IRA, but it gets a bit tricky if you've funded a Traditional IRA in the past. If this is the case, please read 2016 Roth IRA Conversion Rules for more information. Of course, all this assumes you have qualified earned income. Remember, before you can make a Roth IRA contribution of even a single penny, you need to have earned income. This essentially means some sort of compensation from goods or services rendered. Once you have earned income, your 2016 Roth IRA maximum contribution can NOT exceed the amount of money you earn in a calendar year. For example, let's say you're a teenager working a part-time job at McDonald's. You earn $4,200 during the course of the year. Most people under the age of 50 who earn less than the maximum contribution limit can contribute a maximum of $5,500 per year to a Roth IRA. But you can only contribute $4,200 to your Roth IRA. Because you can't contribute more than you earn. And since you only earned $4,200, your Roth IRA maximum contribution is $4,200. But what if you earned $7,500 instead... What's your maximum limit then? The same maximum limit as everyone else. For someone under the age of 50 earning $7,500 per year, the maximum contribution is $5,500 and not a penny more. Generally speaking, if you're under the age of 50, your maximum contribution limit is $5,500. While if you're over the age of 50, your maximum contribution limit is $6,500. Both of these amounts decline as your income rises past the IRS threshold for making the maximum annual contribution. So make sure you pay careful attention to your income as it relates to your tax filing status.